One of my favorite holiday traditions is baking batches of a particular Christmas cookie and giving them as gifts to my friends and colleagues. Because people always ask me for the recipe, I thought that I would post it here along with a few tips on how to save time and simplify the baking process. The original recipe comes from The Joy of Cooking on page 666 (I’m not kidding!) 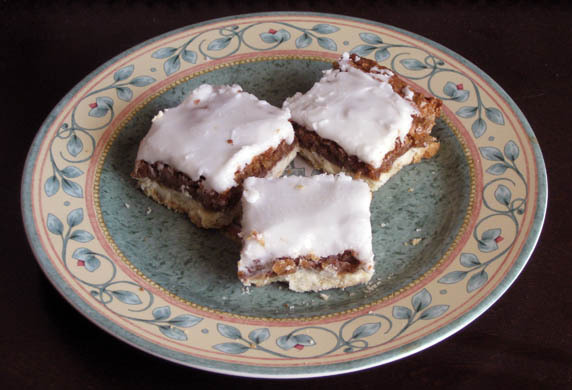 of my old 1981 edition where they are called “Pecan or Angel Slices.” I knew I wanted to make them when I first read, “Many a copy of the ‘Joy’ has been sold on the strength of this recipe.” Enjoy! Cut up one stick of butter, put the pieces in a microwave-safe bowl and “defrost” (power 3) for 1 minute or so until the butter softens and melts a little. Add ¼ cup of sugar to the butter and mix with a wooden spoon until just blended. Add 1 ¼ cups flour, 1/8 teaspoon of salt, and ½ teaspoon of vanilla. Mix until they are blended. Grease the baking pan with vegetable spray or butter and pat the doughy mixture with your hands to line the bottom of the pan. I recommend putting the pan on a small cutting board with rubber edges so the pan stays put while kneading the (often obstinate) dough. I like to rub my hands with soft whipped butter so the dough doesn’t stick. This is a slow process. Take your time and make sure it is as even as possible all around the pan. Bake the bottom layer at 350° for 15 minutes. When the bottom layer is ready, spread the new mixture (all of the above ingredients) on top and distribute evenly. Bake the new layer at 350° for 25 minutes. Let the final product cool completely for at least three hours (overnight recommended). Create the icing by mixing 1 ½ cups of confectioner’s sugar with lemon juice. Use just enough juice to create a good spreading consistency (like soft peanut butter). I find that three substantial squirts of lemon juice from a plastic bottle is usually enough, but you can always add sugar and juice to find the balance you prefer. Don’t make it too thick or the icing will be too hard to spread; it might rip up the surface of the baked pecan mixture in the process. 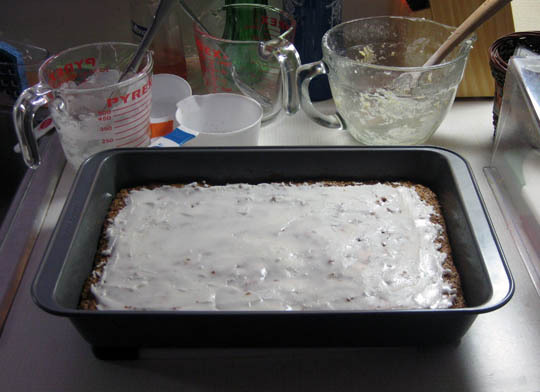 Allow the icing to harden for about an hour before cutting the cake into squares. I recommend putting the pan in the fridge for an hour along with a steak knife (for cutting later). 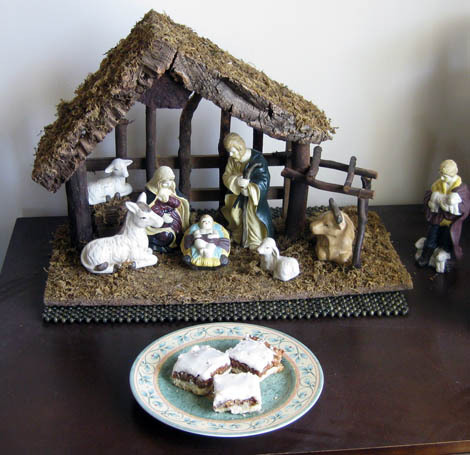 When ready, put the finished product on the small cutting board with rubber edges (so it will stay put) and s-l-o-w-l-y cut the cake into bars with the chilled steak knife (if the knife is cold, nothing will stick). Use short up & down motions (like a dotted line) to cut rather than pulling the knife in a straight line. Cookies fit for a King … or Santa! That’s it! If you don’t like coconut, you can use ½ cup more pecans instead. I recommend buying whole pecans in bulk and grinding them to a consistency of ground coffee with a food processor (I just put the nuts in the machine and press “grind” for 10 seconds). As for the brown sugar, Domino’s Brownulated Light Brown Sugar (the kind you can pour from the bag) works best; it speeds preparation time because it’s easier to measure and mix.